Briastre is a village 18 Kms east of Cambrai and 24 Kms south of Valenciennes. 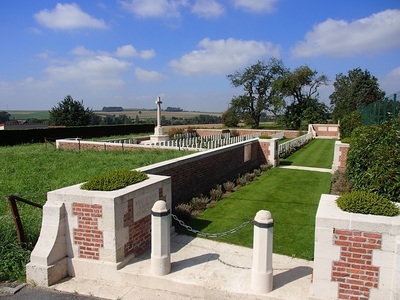 About 800 metres east of the village is Belle Vue Farm and the Cemetery is on the south-west side of it, on the Le Cateau to Solesmes road (D955). Wheelchair access is possible with some difficulty. 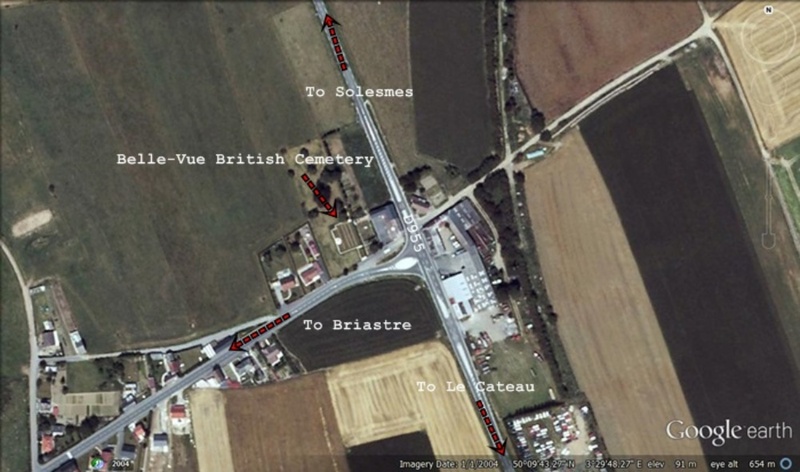 The village of Briastre was taken by the New Zealand and 37th Divisions on the night of 11 October 1918 and on the 20th, Belle Vue Farm was captured by the 5th East Lancs of the 42nd Division. The cemetery was begun by the 42nd (East Lancashire) Division on 23 October, but used for a few days only. In 1922 it was enlarged when 47 graves were brought in from BRIASTRE COMMUNAL CEMETERY EXTENSION. 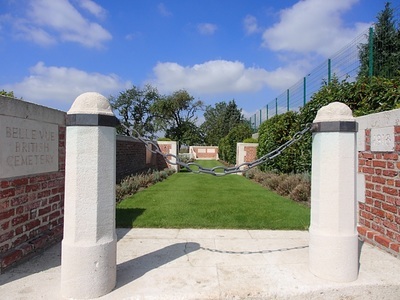 Belle Vue British Cemetery now contains 141 First World War burials, nine of which are unidentified. 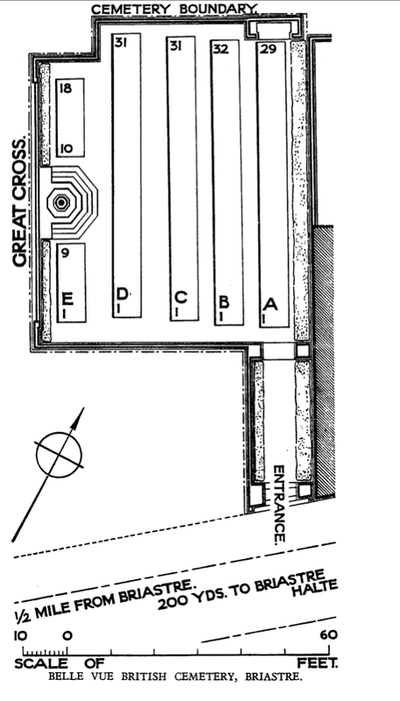 The cemetery was designed by W H Cowlishaw. 23rd October 1918, aged 25. 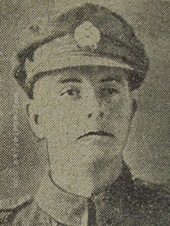 Son of Philip and Mary Ann Couch, of 53, North St., Burnley. Prior to enlisting he was a weaver at Grey's Cameron Mill, Burnley. He won his Military Medal after spending 53 hours laying wire close to the enemy trenches despite being wounded. He died 2 days later after the cellar where he was sheltering was hit by a shell and a splinter hit him in the head. 20th October 1918, aged 35. 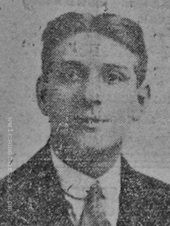 Son of John and Mary Hannah Dand, of 27, Lyndhurst Rd., Burnley; husband of the late Cissie Dand of 8 Westgate, Burnley. 20th October 1918, aged 24. 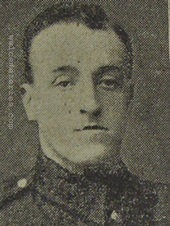 Son of William and Isabella Fletcher, of 163, Lowerhouse Lane, Burnley. Prior to the war he was a weaver at Dugdale's Mill and a talented chorister at the Lowerhouse Wesleyan Chapel.